Don’t overthink Friday. McLain’s Market Lawrence (1420 Crescent Road, Lawrence, Kansas) has Cake & Wine from 6 to 8 p.m. 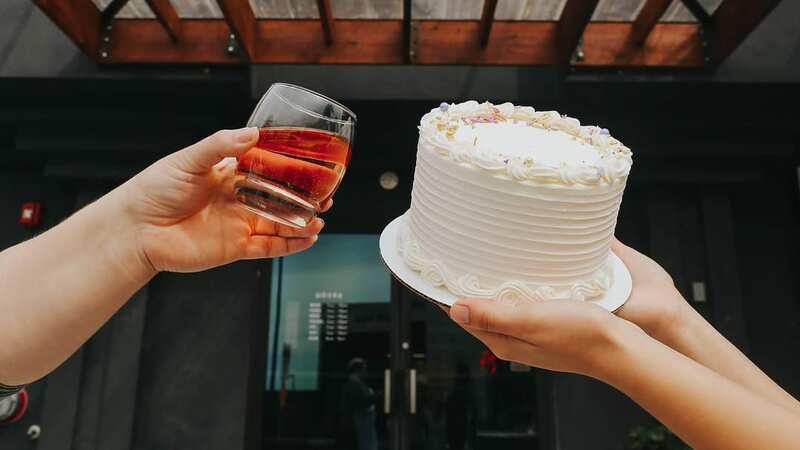 The bakery’s cake decorators lead the class ($65), which includes two glasses of wine, snacks and a two-layer, 6-inch white cake to adorn as you see fit. The flowers are starting to bloom and spring feels like it might just stick around for a while. Welcome to farmers’ market season. It’s opening day for the Downtown Lee’s Summit Farmers’ Market on Saturday from 7 a.m. to 1 p.m. Get plants for your garden, meat and produce or crepes from Seven Swans Creperie. Bay Boy Sandwiches (4706 Holly St.) will celebrate its first anniversary with burgers on Dutch Crunch bread from 11 a.m. to 8:30 p.m. Bay Boy, which began as a pop-up inside neighboring Johnny Jo’s Pizzeria, is a sandwich shop that specializes in Dutch Crunch (sometimes called tiger bread) bread, a loaf with a cracked, slightly sweet top courtesy of rice flour and sugar. If you’re in the Crossroads for First Friday, snag a beer at Touring Taps’ beer garden at 18th and Main, from 4 p.m. to midnight. Play a few yard games and drink a local brew from KC Bier Co., Crane Brewing Co., Cinder Block Brewery or Brewery Emperial. There’s a new food hug in Overland Park, Kansas. Pho Sai Gon is open at 14861 Metcalf Ave. Bowls of pho come in three sizes (small, medium, large). The menu also has banh mi (Vietnamese sandwiches), Vietnamese coffee, spring rolls and mung bean cake. Pho Sai Gon is open from 11 a.m. to 9 p.m. Monday, Tuesday, Thursday, Friday, and Saturday, and from noon to 8 p.m. Sunday. It’s closed on Wednesdays. Sushi King (11440 W. 135th St., Overland Park, Kansas) — which features all you-can-eat sushi for lunch ($12.99) and dinner ($19.99) — is also open. If you’re not feeling up to the food challenge, the Japanese restaurant also has teriyaki, soba noodles and crab rangoon. Sushi King is open from 11 a.m. to 10 p.m. daily. For some of us, the food pyramid begins and ends with cheese. For the rest of you, discover why you should readjust your dairy intake one triangle slice at a time with the Say Cheese Fest ($25). It’s from 3 to 7 p.m. in the Martin City Event Space (13440 Holmes Road, Kansas City, Missouri). Take a moment to stop and sip the tea on Saturday or Sunday. The tea room in the Strawberry Hill Museum and Cultural Center (720 N. 4th St., Kansas City, Kansas) is open from 1 to 4 p.m. on the first Saturday and Sunday of each month. Just a note, it’s cash or check.